Tarik brings five years of business relationship and two years of community sport experience to Sports Without Borders. Written by Katie Smith from Reporter’s Academy (a media production company run by young people). Sporting organisations around Australia are currently facing a number of challenges, from falling participation numbers in some grassroots sport, to the wide use of performing enhancing drugs at an elite and community sport level. Add to that the declining numbers of volunteers and there is a big job ahead of sporting organisations to remain relevant and be socially inclusive. What: 2013 Sports Without Borders Conference – Innovation and Integrity. Media opportunity: Senator Kate Lundy (Minister for Sport) available for interview between 10:45am – 11:05am. The Test, the Open, the Grand Final – these events structure our year as much as the big religious festivals. Questions about Bradman turn up in citizenship exams. In this country sport means something. We’ve spent more on the Olympics than on the National Broadband network. From the top down to the grassroots, we use sports to express our values. Those values have to come from all of us and speak to all of us. They have to change with the times. Sport and parochialism are inseparable in Australia. More then any other country, sport defines who we are, our values and where we are going. The 2013 Sports Without Borders/Our Community national grassroots sports conference (May 3, 2013, Moonee Valley Racecourse) will question whether we who facilitate sports: administrators, clubs, volunteers and National Sporting Organisation’s (NSO’s), coaches, SSOs, are being innovative enough to change with the times. The conference will also address the widely held assumption that grassroots sports clubs are acting in a way that upholds the integrity of sport and its community. management and poor engagement practices.” Pitting Steve Horvat (Melbourne Knights FC board) and Rita Panahi (media commentator and SEN host) against two surprise (secret) debaters, and facilitated by Francis Leach (ABC Grandstand). The conference teams many high profile keynote speakers and MCS, including, Senator Kate Lundy (Minister for Sport, The Hon. Kristina Keneally (CEO of Basketball Australia) and Richard Ings (former head of ASDA), Patrick Skene (Red Elephant) and Josh Vanderloo (AFL) and futurist Steve Tighe, as well as our old friends Paul Kennedy and Brett de Hoedt. The conference will also offer best practice workshops for participants. Get more (and better) volunteers - Josh Vanderloo (Community Participation Manager, AFL). Get more members - Brett de Hoedt (Founder and Mayor, Hootville). The Integrity of Sport - Richard Ings (former head of ASDA). • In the digital age, how do you recruit and retain your volunteers? • In a spectator-led age, how do you develop systems to engage members? • What has to change before under-represented groups – women, people with disabilities, people from culturally and linguistically diverse communities, gay and lesbian people and Indigenous Australians – see your club as relevant to their lives? • What partnerships are becoming possible with emerging stakeholders? • Marketing: not just a good idea, it’s the game. • Learn from the professionals how to innovate – it’ll push you ahead of the pack. 2012 has been a big but successful year for Sports Without Borders. We have continued facilitating important programs in the community and deepened our engagement and consultation with communities across Victoria. Our focus has remained the same – innovation, engagement and leadership. We’d like to take this opportunity to say a very big thank you to everyone who has supported Sports Without Borders over 2012. Pease enjoy these highlights from the year. Linkages and partnerships are the lifeblood of any sporting organisation in Australia, at all levels of the organisation and sport, and administrators need advice on how to link, market and get grants to support their work. The 2012 Sports Without Borders Our Community National Sports Conference aimed to address this need and support sporting organisation by providing insights, case studies, opportunities and connections through great speakers and hands-on workshops. Australians love our sports; the thrill of competition, the warm glow of fellowship and the joys that come with being part of a team drive this passion. But not everybody gets a fair go in Australian sports today. 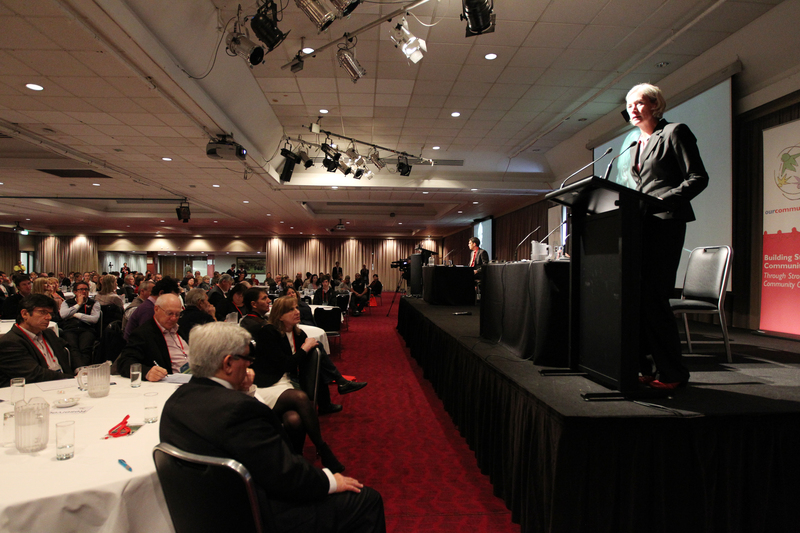 On 27 June 2011, SWB and Our Community staged the inaugural National Community Sports Conference at Moonee Valley Function Centre. The event attracted 380 delegates from around Australia who work in, play or administer sport and/or are involved in the community, as well participants from local and state and federal government agencies. 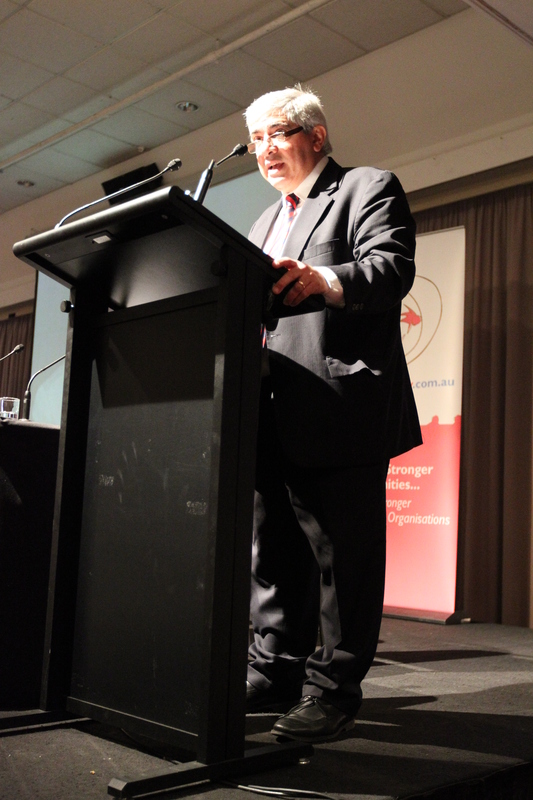 The conference focused on different target communities in Australia, including people from CALD and Indigenous backgrounds, All Abilities and women. The young people of the Carlton area distinguished themselves on Wednesday 28th March, 2011. How? A group of young people from the many newly-arrived cultures of Carlton organized and perhaps established the Carlton Community Sports Carnival held at Melbourne University as a yearly event. On Tuesday March 20, 2012 Sports Without Borders travelled up the Hume to Shepparton to facilitate a sports day for local schools, as part of the DPCD (Department of Planning and Community Development) project. Isik College, Shepparton English Language Centre and Maguire Secondary School and The City of Shepparton itself have large refugee populations. Roundtable Speech form James Demetriou in Canberra. Particpants were Australian Football League, National Rugby League/Australian Football League, Football Federation of Australia, Cricket Australia, Netball Australia, Basketball Australia, Hockey Australia, Football United, Disability and Race Discrimination Commissioner, Australian Multicultural Council, Centre for Multicultural Youth (Vic), Federation of Ethnic Communities Council of Victoria, Foundation House, Settlement of Council of Australia (NSW), Multicultural Development Association, (QLD), Multicultural Youth South Australia, Sports Without Borders (Vic), Vic Health, Australian Sports Commission, Department of Immigration and Citizenship. The first Sports Without Borders National Sports Conference on 27 June, 2011, truly crossed all borders and left those in attendance undoubtedly more inspired and informed about community sport and the need to address issues around inclusion. SWB awarded funds from Victorian Government. The Department of Planning and Community Development through the Minister, the Honourable Lily D’Ambrosio, awarded SWB a significant grant of $360,000 from its Victorian Community support grant on 2nd September, 2010 at Debney Park Secondary College, Flemington. Project aim is to increase the participation of young refugees and newly arrived migrants in sport.